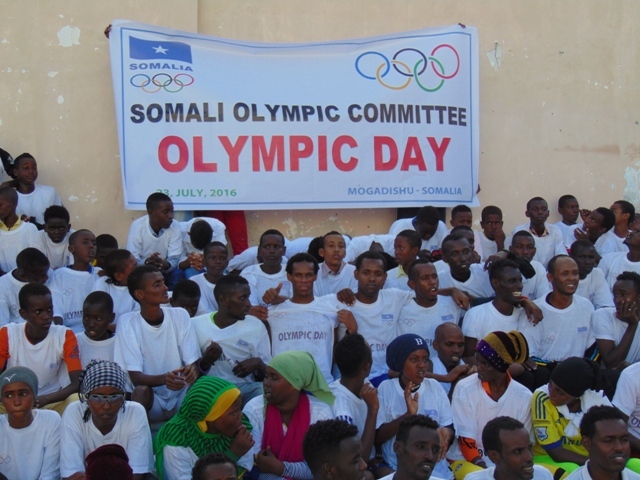 For the first time in the modern history of Somalia's Olympic activities, the Somali Olympic Committee has held one of the biggest and the most attractive commemoration for the 2016 Olympic Day, on Saturday, July 23, 2016. Marking on the occasion of the annually-held Olympic Day commemoration, the Somali Olympic Committee has lunched three colorful ceremonies at the same time in three big cities, namely; Mogadishu- the country’s capital city-, Baidoa and Kismayo, with the participation of hundreds of sports-loving watchers from the overall community groups, included children, youth and women. Among the participants of the events were also some high profile officers from the National Olympic Committee, its Member Federations, and representatives from the local administrations of the cities, in which the ceremonies took place. Addressing the closing ceremony of those festivals, both the director of the regional development department of the Somali Olympic Committee Mr. Ibrahim Hassan Roombe, and the coordinator of the Member Federation Mr. Mohamed Olow, have acknowledged the wonderful performances showcased by the athletes and the other participants of the ceremonies, thanking the SOC Member Federations, and the Zones’ representatives whose contributions are usually necessary for making such commemorations possible. At the end of the celebrations, money prizes were given to the athletes who won the first, second, and third positions in the running events during the commemoration, while some certificates have been distributed to some institutions and individuals, acknowledging their endless support to the well-going of the Olympic activities in the country.